We supply and install vaults, vault doors and panic rooms anywhere in the world. We have a number of solutions to suit differing security requirements and sites with restricted access. Our Talos range of strongrooms and strongroom doors are certified to LPS1175 levels 3-5 and/or EN1627 levels 2-5. They also offer optional ballistic protection to EN1063 BR6 and up to 4 hours' fire protection. Their lightweight design makes them ideal for use as Panic rooms in domestic properties and we can also disguise the doors to look like all the others in your house. In addition to Panic Rooms they make ideal armouries, cash rooms, ATM Pods, data centres, IT rooms & archive storage rooms. Our flagship Cerberus strongrooms come in 4 standard security levels, including Europe's highest rated security vault, Grade XIII EXCD. They are designed to resist the most powerful cutting and drilling tools, including core drills, angle grinders, oxyacetylene torches & thermic lances. All of our Cerberus vault rooms and vault doors also include protection against explosive attacks. 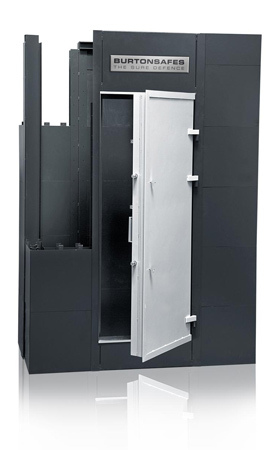 Our vaults are custom made to fit your site and can be customised with a number of optional extras, including ventilation, seismic detection, CCTV and sophisticated pin code and biometric locking options. Vault doors can be supplied as standalone items for customers who have built their own vault walls. Our specially designed fixing brackets will ensure that your door can be securely and easily concreted into your walls. Day gates are available in painted, stainless steel or glass finishes and automatic closers can be added to these.